Commuters Ditch Cars For Public Transit In Record Numbers More Americans are hopping on buses or taking trains to get to work. Ridership in the U.S. is now the highest it's been in more than a half-century. During the morning rush at Chicago's Union Station, commuter trains pull in, the doors open and a crush of people, newspapers and coffee cups in hand, pour off like a flood. Financial analyst Nader Kouklan says he makes the trip from the suburbs to Chicago's downtown every day. "It's easier and just a faster way to get to work, rather than having to deal with the traffic of the morning commute," Kouklan says. Law student Amalia Romano rides Chicago's Metra line, too. "I take it because I don't want to pay $16 to park every day," Romano explains. Romano and Kouklan are among the increasing number of Americans using public transportation. Across the country, public transportation ridership jumped last year to its highest level in more than 50 years. 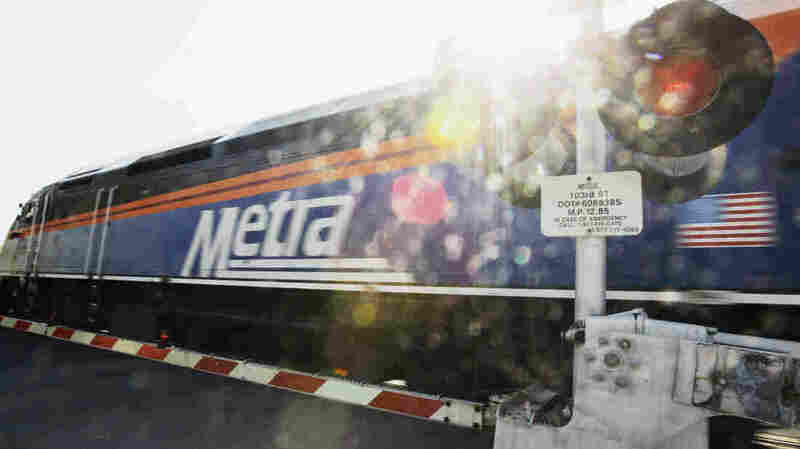 Metra spokesman Michael Gillis says on a typical workday, the rides people take on Metra total about 300,000. The total for last year was 82 million trips, a 1 percent increase in ridership over 2012. "Employment had a lot to do with it — just the gradual gains in employment in the region," Gillis says. "Downtown occupancy ticked up a little bit, so that helps." One other big reason: Chicago sports. A few days after the Blackhawks won the Stanley Cup Championship last year, 425,000 people rode Metra to join about 2 million hockey fans at a huge Blackhawks rally downtown. "That was probably one of the busiest days in Metra history," Gillis says. Throughout the entire country, just about every public transportation system saw hikes in ridership, according to a recent study from the American Public Transportation Association. President Michael Melaniphy says Americans took 10.7 billion trips on public transportation last year. "That's huge," Melaniphy says. "This is the highest ridership number we've had in public transportation in 57 years." Nationally, bus ridership was flat in 2013, due in part to horrible winter weather. However, ridership numbers for subways, elevated trains, street cars and trolleys were up. "Cities under 100,000 have had ridership increases on average of 3.83 percent," Melaniphy says. "We've seen ridership increases in big cities as well. New York had a huge ridership increase." Public transit agencies in Ann Arbor, Cleveland, Indianapolis, Flagstaff and Denver were among those reporting record ridership levels. In Utah, where several new transit lines opened around Salt Lake City, the number of people traveling by commuter rail rose a whooping 103 percent over the year before, says Utah Transportation Authority spokesman Remi Barron. Utah has been on a public transit building boom, Barron says. A new commuter line runs between Salt Lake City and Provo. Three light rail lines run through and around Salt Lake City. "Our airport line's been particularly popular, especially with skiers and visitors, because now people can get right off the plane, they can hop on the light rail train and they can be downtown in 15 minutes," Barron says. College student Spencer Saddler takes FrontRunner, UTA's commuter line, about three times a week. He says when he used to drive, he'd often get stuck in traffic. "It's just really annoying, and you look over and see FrontRunner just racing down the tracks," Saddler says. "Like, I could be sitting in there right now, taking a nap or doing homework." A previous Web version of this story incorrectly attributed the quote about UTA's airport line to Michael Melaniphy. That comment came from UTA spokesman Remi Barron.